American Standard Flushometer Elongated Toilets Are Used For restrooms in malls, schools, hospitals, office buildings and more. Choose from floor or wall mounted units. ADA complaint models are barrier free for handicap access. EverClean models feature a permanent glaze additive to protect the pipes from mold, mildew, algae and fungus that can cause deterioration or staining of pipes. All models have a 1-1/2" top or back spud. Flush valve and seat sold separately. 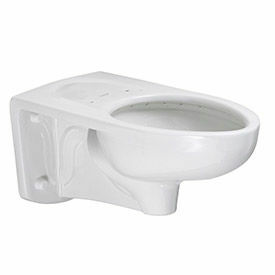 American Standard Two-Piece Toilets Are Used For Residential And Commercial Installation Applications. Two-Piece Toilets With Everclean Surface are made of Vitreous Chinaware with chrome finish trip lever for long lasting duability and optimum performance. 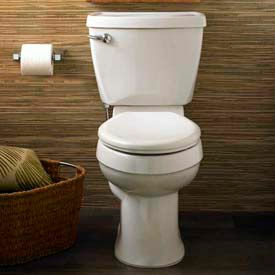 High Efficiency Toilet (HET), ultra-low consumption utilizes 20% less water and meets EPA WaterSense criteria. EverClean System helps keep itself clean longer. The permanent glaze additive is incorprated into the circulation piping to protect the pipes from mold, mildew, algae and fungus that can cause deterioration or staining of pipes. Super smooth mirror like EverClean surface is easier to keep clean and can withstand years of use providing easy maintenance. Trade exclusive tank with PowerWash® rim scrubs bowl with each flush provided additional sanitation. Includes EZ-Install Tools w/color match bowl caps. Oversized flush valve and generous water surface area. Available styles are Cadet or Champion with Powerwash or Pressure-Assisted Siphon Jet. Dimensions vary per model. Acorn Elongated Security Toilets Are Used For High-Use Demand In Institutions, Hospitals, Industrial Settings, Prison & Correctional Facilities And More. Acorn Security Toilets are made with 16-gauge, type 304 recycled stainless steel and finish for long lasting performance and durability. Stainless Steel fixtures match rough-in dimensions for most existing vitreous china toilets in environments requiring cost effective and hygienic products. Stainless steel withstands greater pressure and force thereby reducing safety risks and replacement costs. Front-mount only with floor or wall mount options. Color finishes are Stainless Steel or White Enviroglaze. Width is 14". Other dimensions vary per model. All toilets accommodate 1.28 GPF, 1.6 GPF, or 3.5 GPF flushometers. 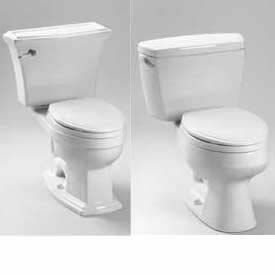 TOTO® Two Piece Toilets Are Used For Residential, Commercial, Industrial Or Institutional Applications. 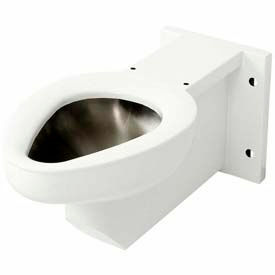 TOTO® Toilets are solidly manufactured for long lasting durability and dependability. Sturdy molded Vitreous China tank and elongated bowl design. Tank has insulated lining, bolt down tank lid and chrome plated trip lever. Economical, low consumption 1.28 and 1.60 GPF siphon jet flushing action. Models come in a variety of attractive finishes, including Bone, Colonial White, Cotton, Ebony and Sedona Beige. Cotton finish also available with SanaGloss glaze that prevents debris, mold and bacteria from sticking to porous, ceramic surfaces. Come in 17-7/8, 19-1/8, 19-1/2, 20-5/8 and 21-1/4 inch widths, 26-1/8, 26-3/8, 28, 28-1/8, 28-1/2 and 28-7/8 inch depths and 28-1/2, 28-3/8, 31-5/8 and 32-1/2 inch heights. Seats not included.